Jo Clancy is a contemporary Aboriginal choreographer, dancer and teacher.She was raised and still lives on Darug and Gundungurra country in the Blue Mountains. Jo commenced her full-time dance training at NAISDA Dance College in 1990 and then went on to the University of Western Sydney. Upon graduating from UWS, Jo worked as an independent Dance Artist performing and teaching throughout Western Sydney and the Blue Mountains and was Head of Dance at NAISDA Dance College from 2005-2007. 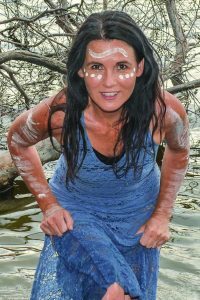 Over the past twenty-five years Jo has developed many Contemporary Aboriginal dance works and education projects for festivals and events throughout Australia and overseas. Also, she is the founder and Director of the Wagana Dancers and teaches in schools and communities. Jo sits on the Board of Studies for NAISDA and coordinates their Create NSW Garabara Ngurra High School Dance Camp.